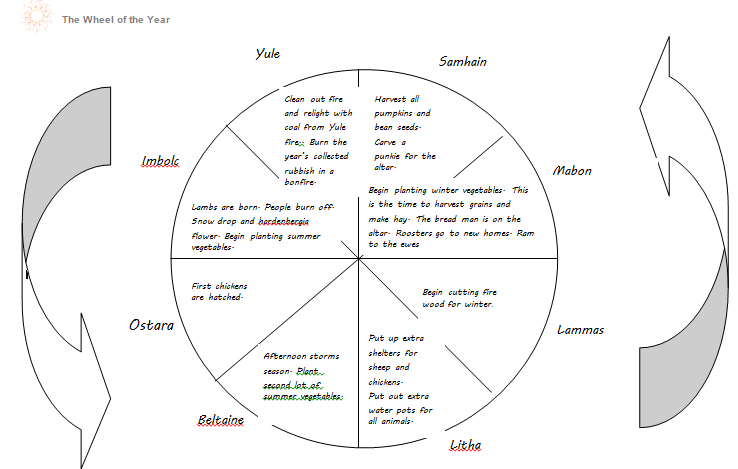 In our home life we use the pagan ‘Wheel of the year’ as a calendar to plan work and play on and off our property. I find that using sabbats as a guide for farm work is efficient and just makes sense. 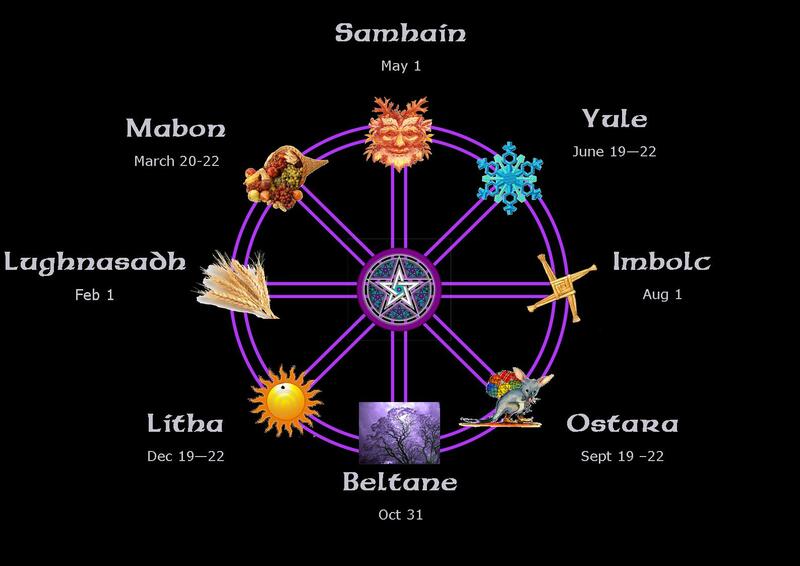 The Wheel of the year (hereafter known as the Wheel) originated in the northern hemisphere, in the Celtic world (and probably many other cultures too). This means that the traditional festivals and feast days that mark the turning of the seasons (Christmas, Easter, Halloween, Candlemas, etc) just don’t apply to us here in the southern hemisphere. We all know that when it is summer here it is winter in the UK and US, don’t we? Because of the tilt and spin of our planet we have endlessly varied seasons and climates. This also means that pagans need to recalculate their sabbats so as to be in line with the natural world, fortunately this is easy; we just ‘spin’ the Wheel forward by six months. As most pagan religions arose from rural farming societies and worship Nature in her many forms, the sabbats and rituals which are common to them have a practical side. I know that when the snowdrops and hardenbergia flower at Imbolc (beginning of spring) that the sheep will soon be giving birth. I know that when I bless the beans, squash and corn seeds on our Ostara (spring equinox) altar it is time to plant them in the garden. I know that when I pick a pumpkin to make a Samhain (beginning of winter) jack-o-lantern it is time to bring in the whole pumpkin crop because frosts are imminent and that when I let the house fire die at Yule (winter solstice) and bring home a candle or a living coal from the Yule fire to relight it I have cleaned out the fire box of all it’s accumulated ash just before the deep bone chill of winter sets in. I have been making myself a graphic organiser showing all the jobs around the humpy that relate to the Wheel. What do you think? Harvest seed crops and preserve foods; jams, chutneys and dried food. Put harvest foods on the altar. Spare lambs go to new homes. Lambs are born. People burn off. Snow drop and hardenbergia flower. Begin planting summer vegetables. Harvest all pumpkins and bean seeds. Carve a punkie for the altar. Clean out fire and relight with coal from Yule fire.. Burn the year’s collected rubbish in a bonfire. Begin cutting fire wood for winter. Afternoon storms season. Plant second lot of summer vegetables. Put up extra shelters for sheep and chickens. Put out extra water pots for all animals. Of course it doesn’t show all the work of the year yet. It’s a work in progress, like so many other things here at the humpy.